College girls and fashionistas, Stylago is a new store on MG Road that has super cute casual wear at affordable prices. Besides, everything from crop tops to gowns is imported straight from Korea, and we're sold! Barely three months old, Stylago has the look of a regular local boutique, but walk in for a surprise! It houses two storeys of clothes and accessories imported from South Korea. On the first floor, we found dresses and gowns that you could wear to a house party and accessories that you can wear to college every day. They have wallets and bags (Reminding you of Victoria's Secret's Pink bags) that come in pastel hues, necklaces, earrings and chokers you can pair up with the cute dresses from here. On the second floor, we found crop tops with oh-so-cute designs and patterns. 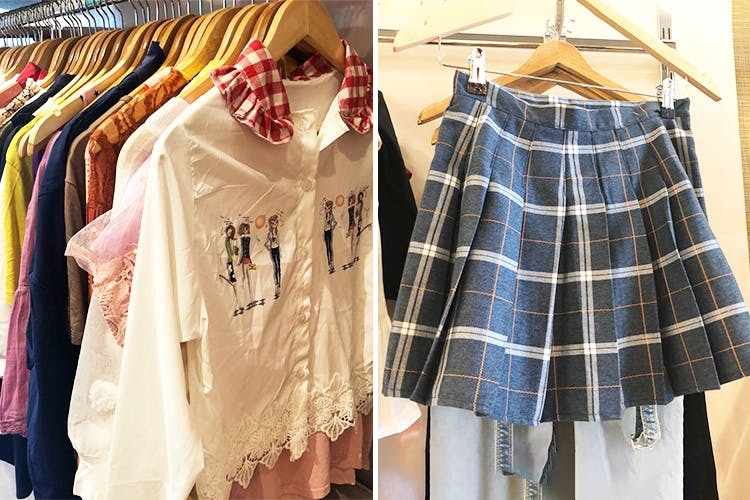 Think of high school fashion in Los Angeles or your favourite high school romance, and that is how you can look too wearing the checkered mini skirts, denim, and dungarees from here. We found a comfy shirt with unicorn and rainbow pinnets that gave the Tumblr girl in us major goals for a shoot. We also picked up a collared top, checkered mini-skirt and are ready to rock a Lara Jean Song Covey. The store also has one-pieces fit for a night out, and cardigans too, but we loved the comfy wear much better. Speaking of which, let us tell you can you can get adorable pyjamas and inners from here as well, starting as low as INR 220. Time to do those Pyjama Parties right, chicas! If you don't find your size here, the store is happy to alter your pick to fit you perfectly well.